The steep hills that jack up from the Wainui Valley floor. 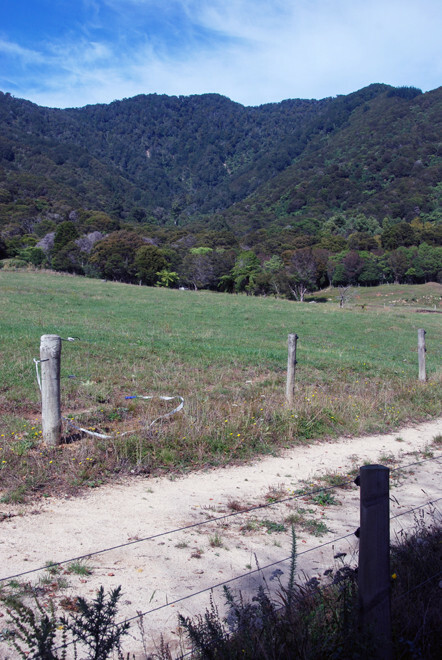 The Wainui River picks out the Wainui Shear Zone - the eastern edge of the Pikikiruna Fault. 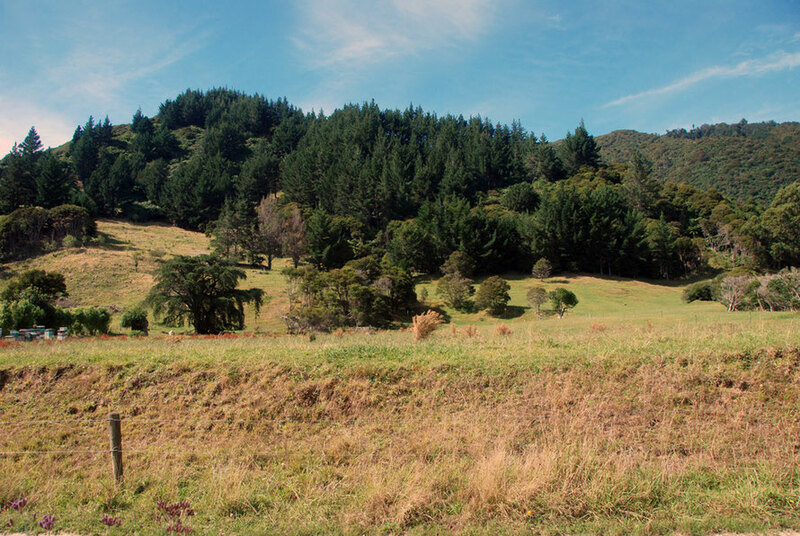 This was a short walk we did up the steep-sided Wainui River valley that feeds into Whanui Bay. 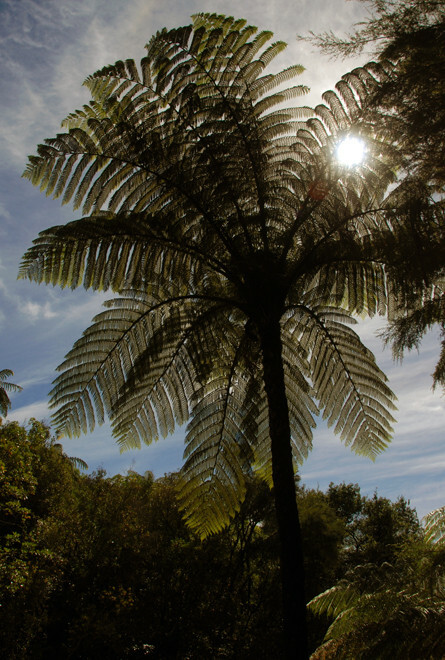 It was a hot day and the shade of the forest - often dominated by tree ferns - was delicious. 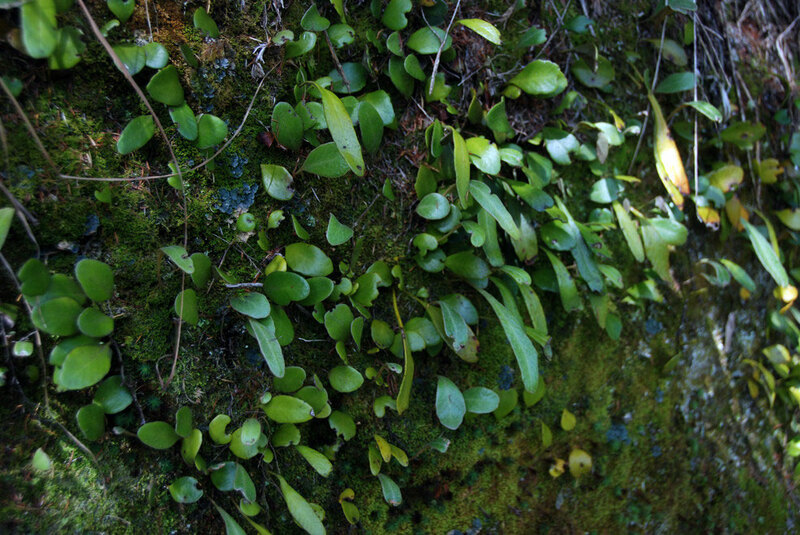 The river had been subject to intense flooding and all the mosses and liverworts on the river boulders had been washed away. 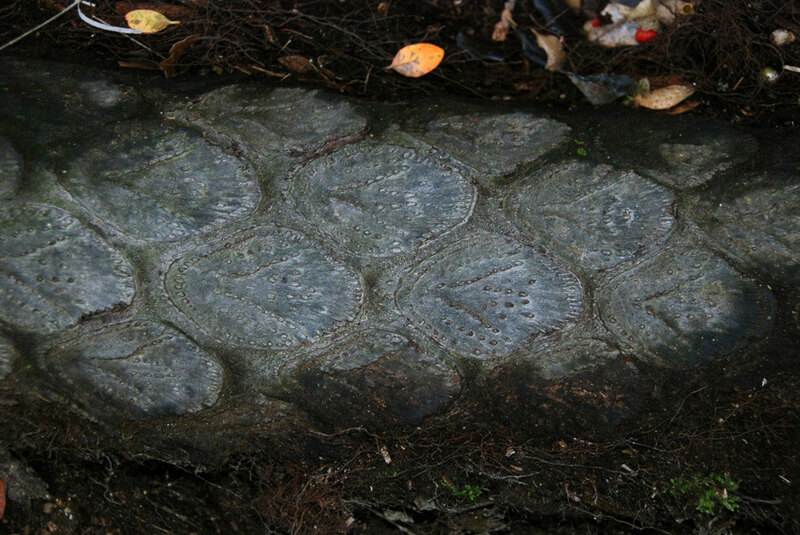 The river bed had a skeletal look to it. The falls were OK but it had been a dry period. 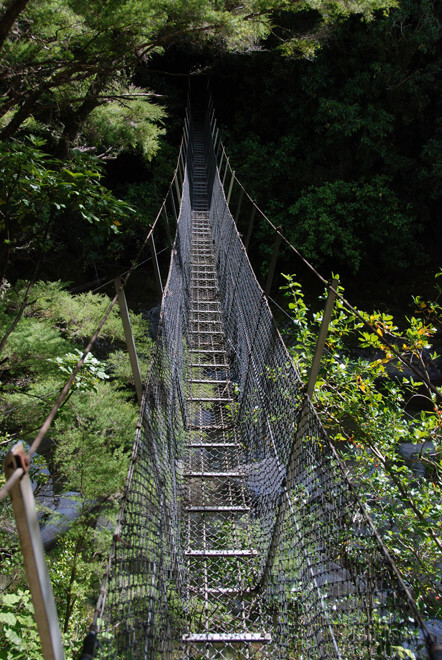 For us the highlight was the hanging wire bridge would swayed alarmingly in the middle. 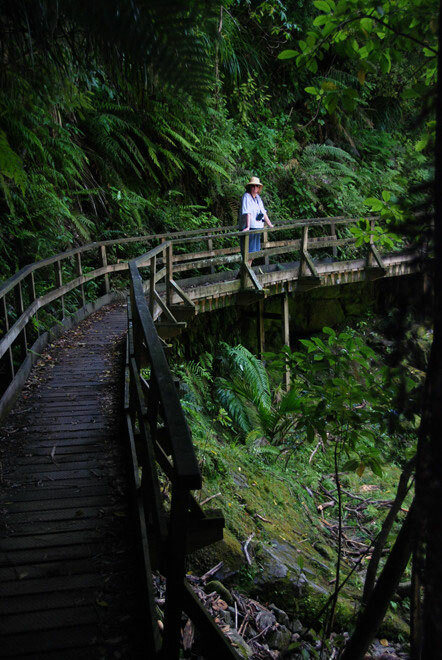 The contrast between the farmed land with its introduced exotic pines and the native bush is stark on the Wainui Falls walk. 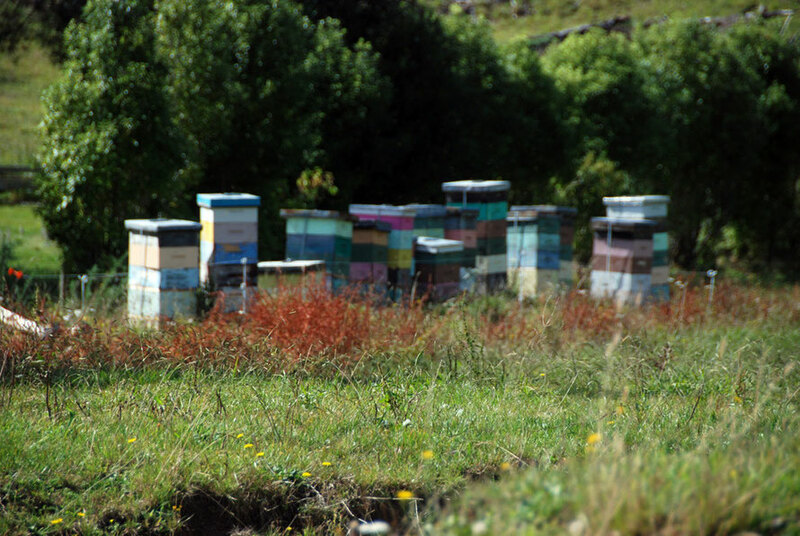 Brightly coloured beehives (sadly out of focus) at the start of the Wainui Falls walk near Pohara. 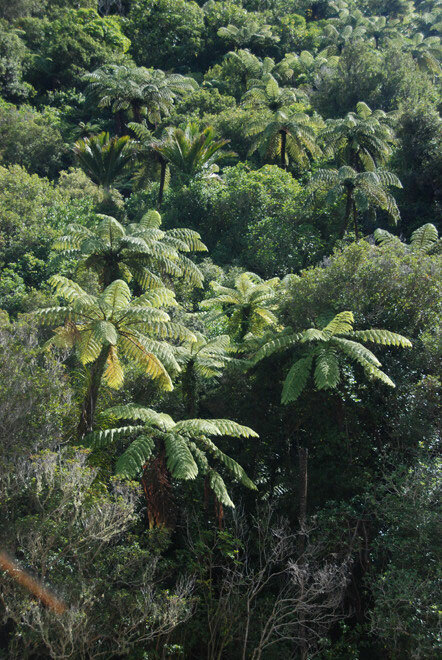 Mamuka, nikau palms and rata in scrub forest at the bottom of the Wainui Waterfall walk, Golden Bay. 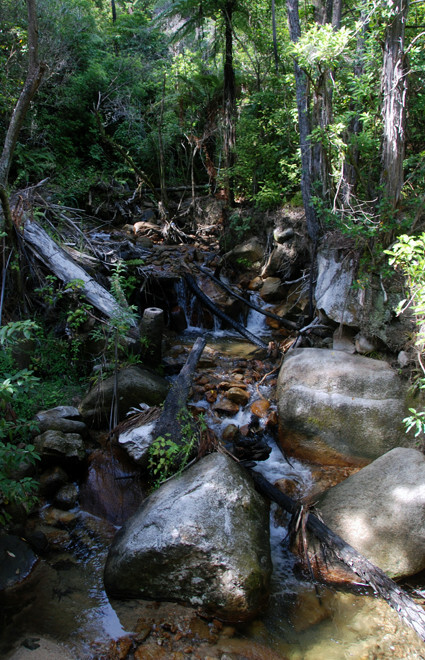 Flooding has gouged out torrent-paths through the forest. 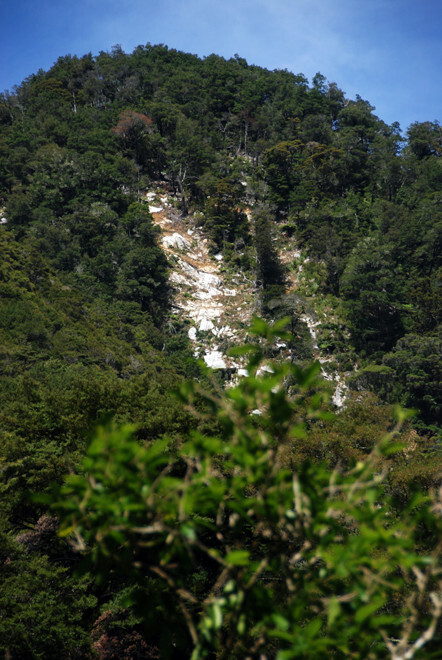 The extremely steep, deeply incised valley sides of Wainui River showing scars from frequent landslips. 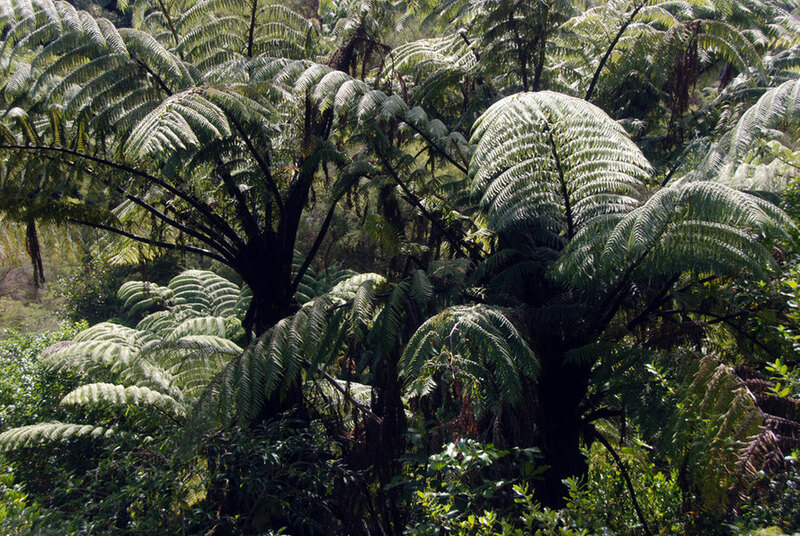 Tree ferns (probably Mamamuka/Black Tree Ferns) dominate the lower forest on the Wainui Falls walk. 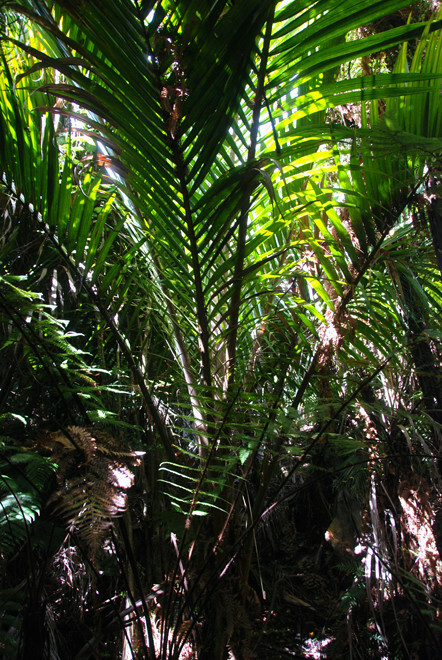 Young Nikau Palm on the Wainui Falls walk in Golden Bay. 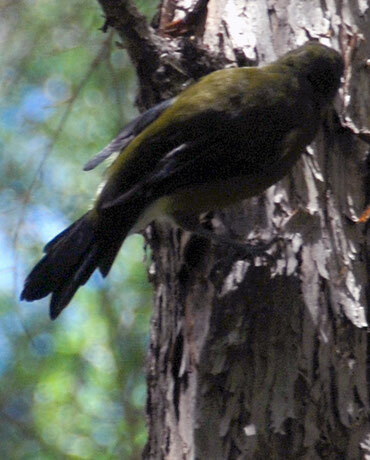 Rear view of Korimako/Bellbird (Anthornis melanura) on Halls Totara the Wainui Falls Walk, Golden Bay. 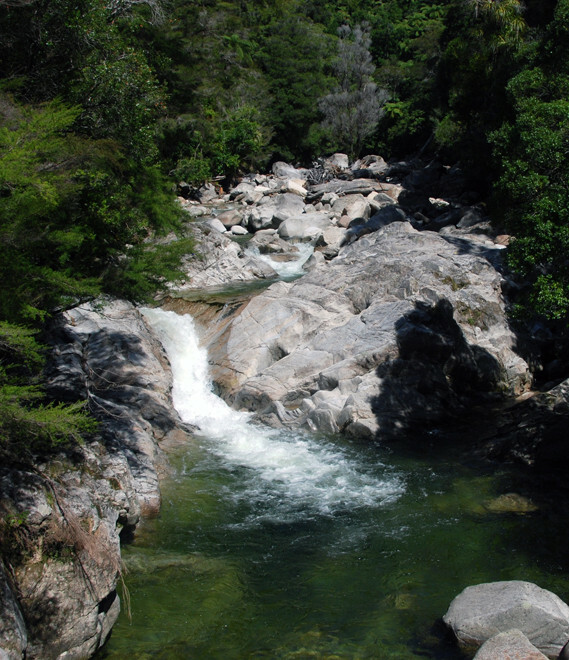 The crystal clear waters of the Wainui River that flows down from the marble table land at Canaan Downs on Takaka Hill. The rocks stripped bare of mosses and lichens by terrible floods. 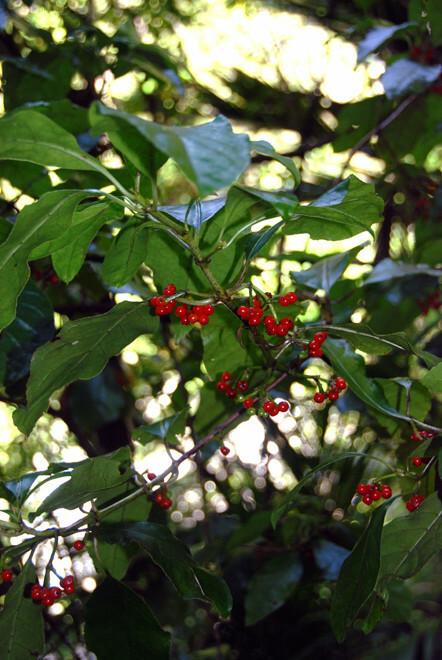 Karamu - Coprosma robusta ? The swing bridge across the Wainui River that indeed did swing. 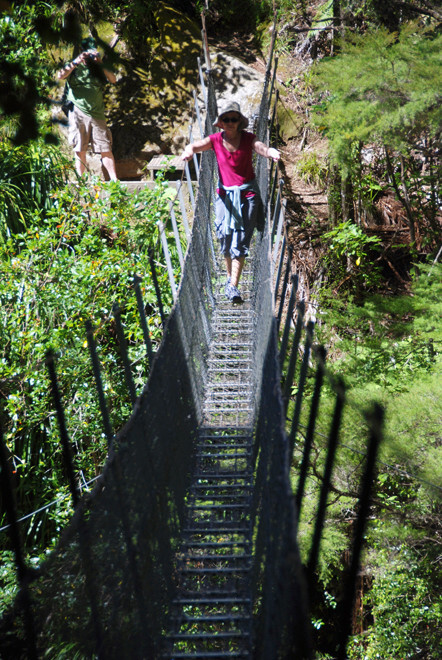 Karen takes on the swing bridge over the Wainui River in Golden Bay. 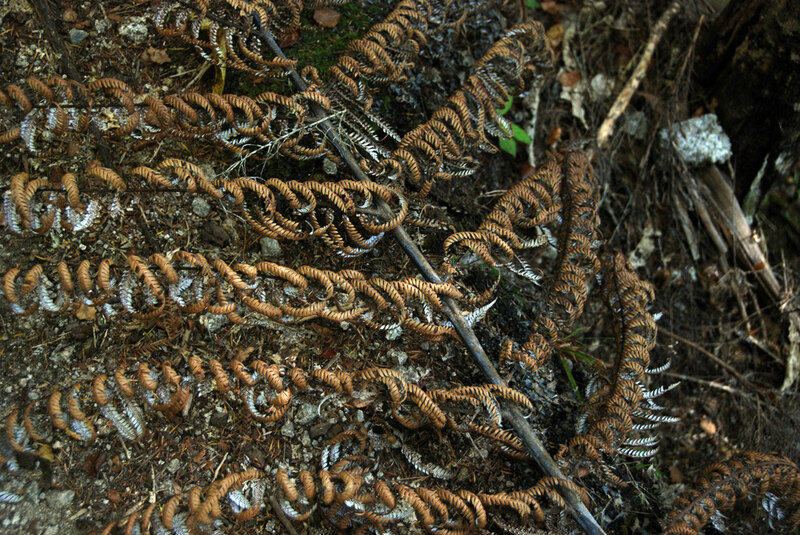 Patterning on fallen tree fern 'trunk'. 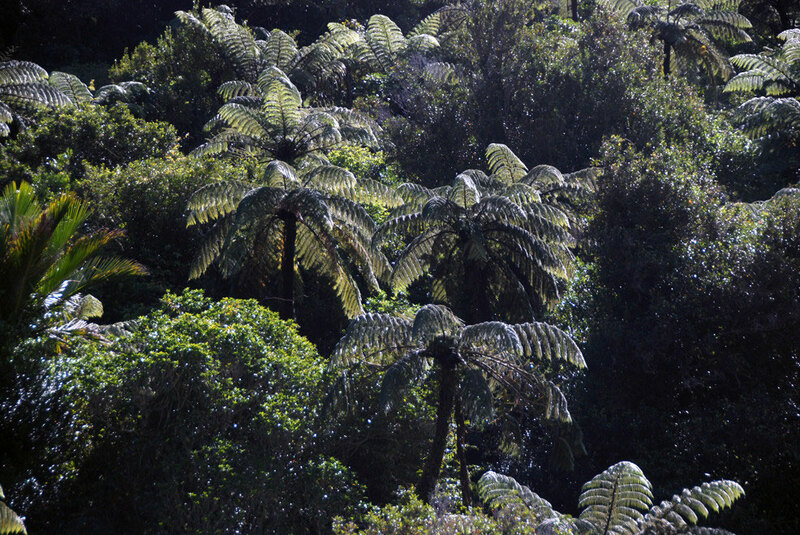 Tree ferns and skeletal bleached rocks on the Wainui Falls walk. 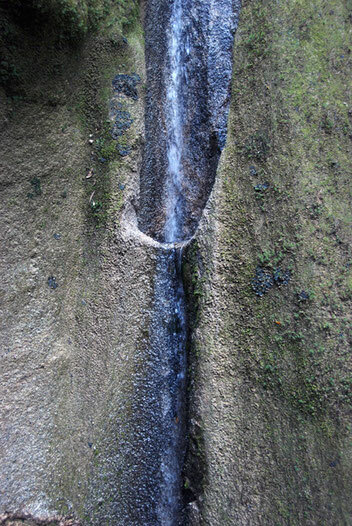 Water everywhere in the rain forest. Annual rainfall is over two metres even in the lowland forest. 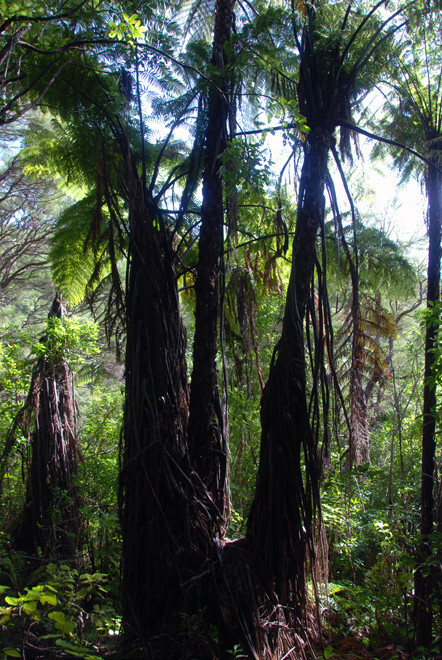 The damp, fetid forest on the north west side of the Wainui River valley. 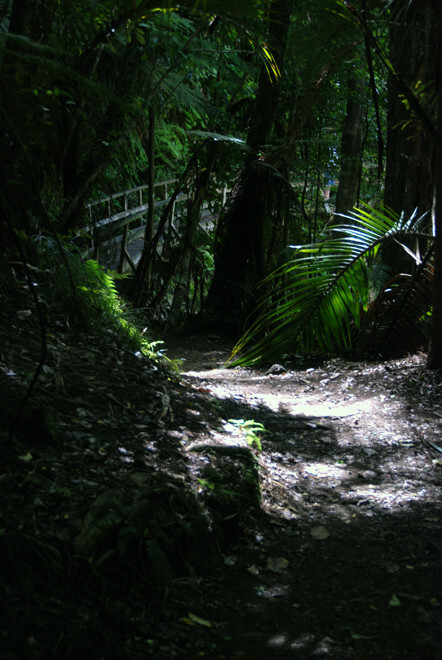 Deep shade on the north western side of the Wainui Valley. 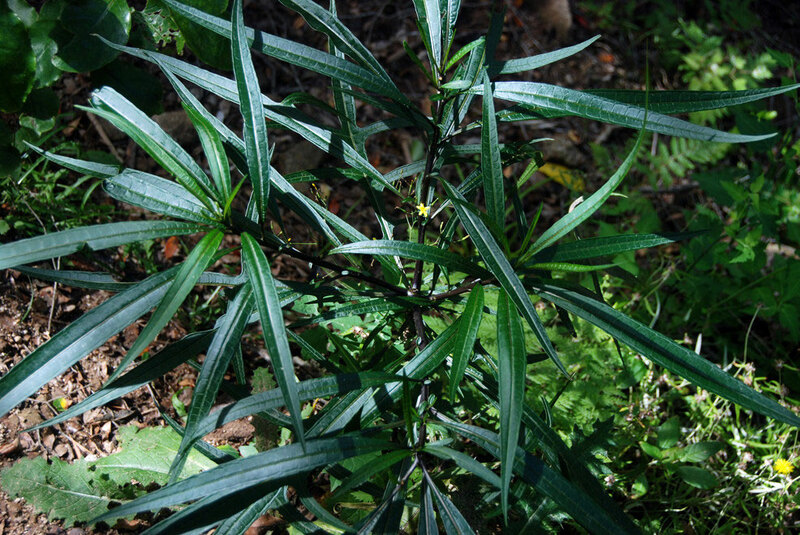 Solanum aviculare/Poroporo - a member of the nightshade family on the Wainui Falls Walk. 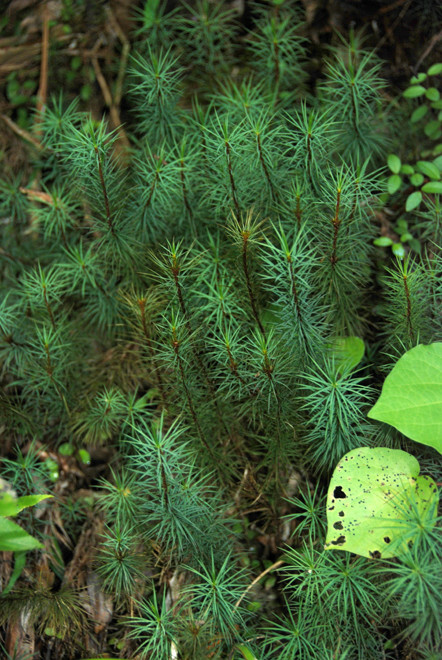 Wainui Falls Walk: Dawsonia Superba is the tallest moss in the world, growing to a height of 60cm. 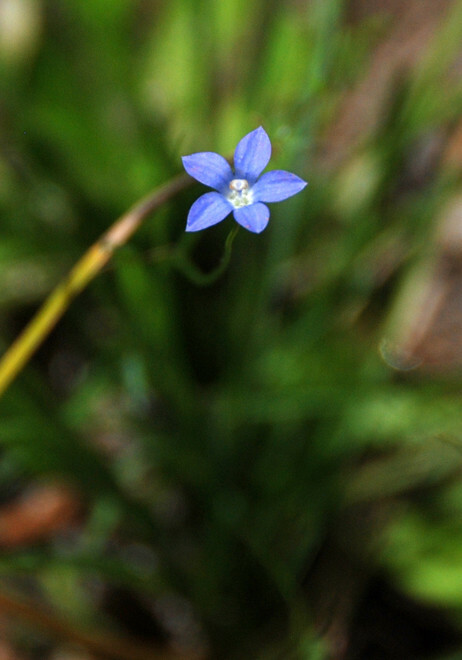 A rare blue flower in New Zealand's predominantly white coloured endemic flowers. 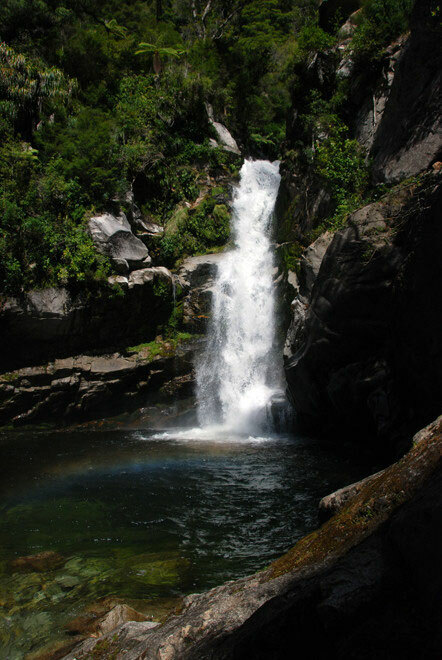 The Wainui Falls after a dry spell. Cutting through limestone they are here held up by a granite instrusion that forms of the Separation Point granites. 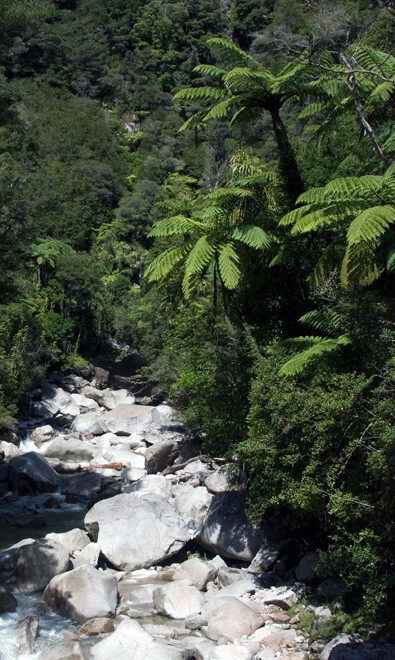 A mini cascade on the vertiginously steep valley sides of the lower Wainui River, Golden Bay. 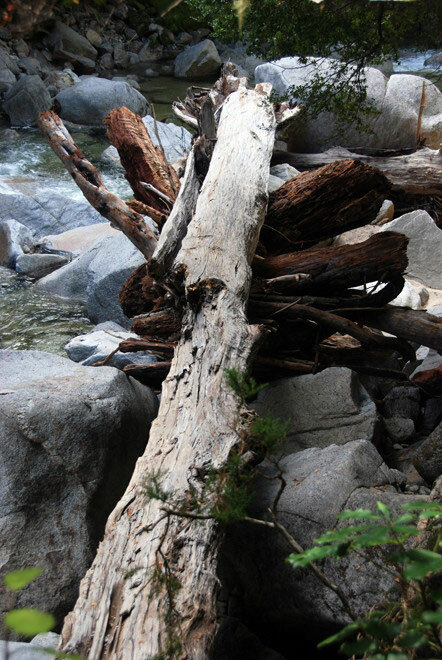 The size of the logs washed down the Wainui River attests to the strength of flow during flooding.